I’d previously read two books by the Italian semanticist (Foucault’s Pendulum and The Name of the Rose – his two most famous novels (the latter because of the film starring Sean Connery and Christian Slater)) and, compared to them, this was a disappointment. All three books focus on investigations. Foucault’s Pendulum is a modern day conspiracy theory-type story featuring a character who may or may not be the Count of St Germain. The Name of the Rose is a historical thriller about murders and heresy. 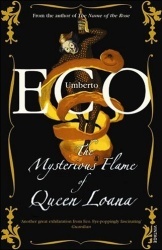 The investigation in The Mysterious Flame of Queen Loana is into the narrator’s own past. He turns out to be a fifty-nine-year-old antiquarian bookseller named Giambattista Bodoni, or Yambo, as he finds he prefers to be known. A heart attack has wiped out all his specific memories; what is left is all his background knowledge. For instance, he can remember how to brush his teeth when he stands in the bathroom with the toothbrush in his hand, but he can’t remember ever having done so. The other thing he is left with is literature. His preconscious mind continually throws up apposite quotations from books, comics, plays and films. As he recovers his health and days go by, he becomes more and more intent on researching his past in order to discover who he is, or at least who he was. This investigation takes him to the home he lived in as a boy, which stayed in his family and which has in its attic (conveniently enough for the story) boxes of books, comics, records, newspapers and magazines. Lots of what he (re)discovers is quite interesting – dubious characters in pulp fiction, American comic books Italianised by the fascist authorities, newspaper articles that hint at wartime defeats. And, as interesting as all this stuff is, I constantly got the feeling that it was a kind of masturbatory ode to the author’s own youth. Unfortunately, it takes a while to get to this part and the earlier part of the book seemed disjointed and didn’t flow well, or just didn’t have much force. Maybe this was because the main character is, while likeable, not that interesting. He finds out that he is something of a womaniser – he’s had a few affairs, he has a dazzling smile. Although he is initially wary of going to the country to continue relearning himself, he is never particularly challenged and all his acquaintances are friendly and helpful. There is a major turning point at about two-thirds of the way through the book where Yambo suddenly remembers nearly everything that’s ever happened to him. This last segment of the story is a series of anecdotes. There is a little more narrative force here, but it still has a rather self-indulgent feel to it – a feeling that is in no way moderated by the hallucinatory conclusion to the novel. Along with the text of the story itself, the pages of the book are peppered with pictures of magazine and novel covers, a few photographs, pages from comics and complete song lyrics. Although Eco can be commended for trying to utilise the novel format to its fullest, they all seemed like distractions to me – probably because, by the time they started to be introduced, I was already wearying of the book. All in all this was an unsatisfying read. The concept was excellent – a man with no memories, an investigation into time, memory, history, culture – but the execution was flawed by the lack of much of a story, minimal character dynamics and that pervasive masturbatory quality.